With its idyllic rolling hills and sparkling lakes, the Finger Lakes region is one of the area’s most beautiful. Known for its award-winning wineries and jaw-dropping waterfalls and gorge trails, the region also offers plenty to do for kids of all ages, making it a great choice for a family vacation. Named for its eleven finger-like lakes, the region stretches from Great Lake Ontario all the way down to the New York-Pennsylvania border. Seeing all of the area’s attractions in one weekend is nearly impossible, so we recommend choosing a home base central to the sights you most want to see. For this post, we’re focusing on the Ithaca area (you can also read our previous post on 48 Hours in Rochester here). 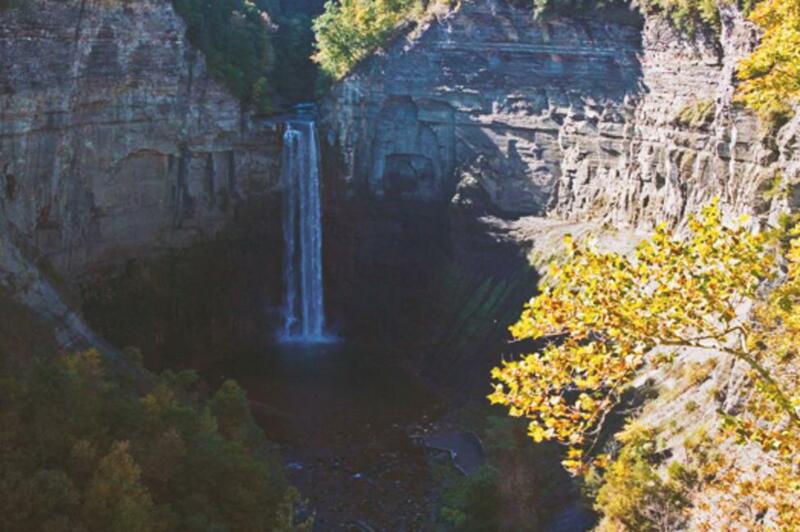 This vibrant college town boasts more than 150 waterfalls across 10 square miles (no wonder Ithaca is Gorges!) and more restaurants per capita than New York City. Stop by the Ithaca Farmers Market at the tip of Lake Cayuga for a fresh and healthy breakfast. The market, which opens only on the weekends, is a foodie&apos;s dream with more than 100 vendors selling locally-grown produce, ready-to-eat delicacies, and artisanal crafts and gifts. 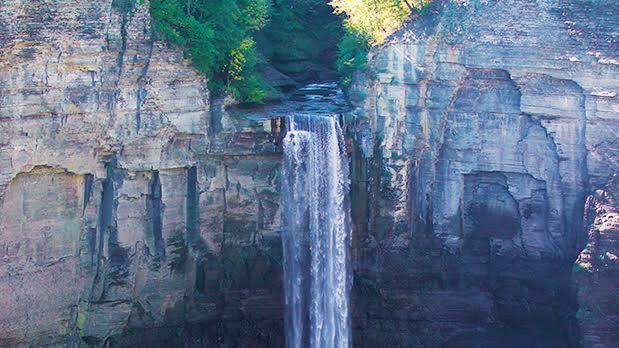 Just eight miles north of Ithaca, Taughannock Falls State Park is an oasis offering a plethora of activities from boating and fishing to camping and a lakeside swimming beach. But the park’s main attraction is its 215-foot waterfall, 33 feet higher than Niagara Falls itself! The base of the falls is at the end of an easy ¾ mile hike along the gorge trail dotted with smaller waterfalls along the way. For another view of the waterfall, hike or drive up to the Falls Overlook and you’ll have quite the family photo opp. A visit to the Finger Lakes isn’t complete without experiencing some of the nation’s best wine. The easiest way to work in a tasting while traveling with kids? Lunch at the vineyard! 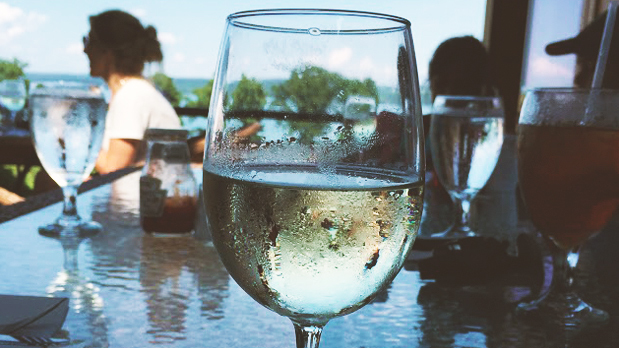 The Thirsty Owl Wine Company, just one of many award-winning wineries on the Cayuga Lake Wine Trail, boasts a lakeside bistro that serves family-friendly favorites like flatbreads and burgers alongside their delicious wines (try the Snow Owl!). Sit on the bistro’s large outdoor patio for spectacular views of the lake. Stop by the tasting room for a friendly and efficient pour of your choice of five samples for just $3 and receive a $2 voucher off the bottle of your choice if you choose to buy what you taste. Drive back to Ithaca and treat the whole family to the town’s other claim to fame -- the ice cream sundae. Legend has it that the ice cream sundae was invented at Platt & Colt’s Pharmacy in Downtown Ithaca in 1892. Though the original consisted of plain vanilla ice cream smothered in cherry syrup and topped with cherries, visitors to Purity Ice Cream can choose from a plethora of options that even include soy-based ice creams and gluten-free cones. The newly reconstructed Ithaca Commons is a four-block pedestrian-only zone in downtown Ithaca. The Commons boasts more than 100 unique shops, restaurants, street vendors and street entertainers. After you&apos;re done hitting the stores, stop for dinner. With restaurants representing a diverse range of cuisines in the Commons and bordering Aurora Street (commonly known as Ithaca’s “Restaurant Row”) there’s something for every taste. Vegetarians will be especially pleased as the Commons includes Moosewood Restaurant, which is renowned for its meatless menu and bestselling cookbooks. From the durable windshields in our cars to incredible objects of art that go back centuries, glass is nearly everywhere you look. The Corning Museum of Glass is the world’s greatest tribute to the material, and it’s right here in New York State! Here you can tour galleries showcasing more than 3,500 years of glass art, watch demonstrations on everything from hot glass and flame-working to glass- breaking by master glassmakers, challenge the kids to a museum-curated scavenger hunt (just pick up activity sheets at gallery entrances or download the PDFs from the museum’s site), and learn about the application of glass to our everyday lives in the Innovation Center. No visit to the Corning Museum is complete without trying your hand at making your own glass masterpiece to take home. Whether you decide to blow an ornament or create a glass fusion photo frame, the museum’s expert glassmakers will guide you through the whole experience. The workshops get booked up fast, so the museum recommends pre-booking online to ensure you get the time slot you want. 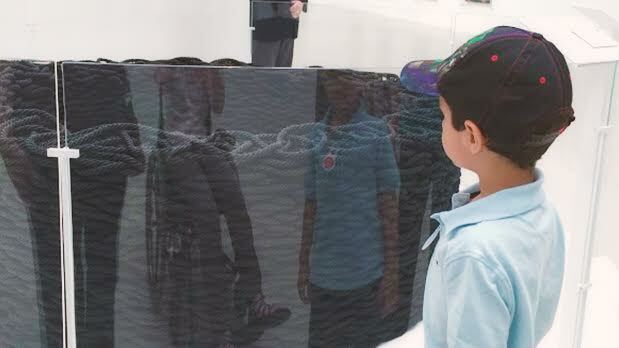 Want to learn more about the Corning Museum and the art of glassmaking? Check out our interview with Eric Meek, manager of the museum’s hot glass programs. For lunch, recharge your batteries at the museum’s café where you’ll find everything from kid-friendly favorites like pizza and burgers to international delights. Make a picnic of it on a nice day by taking your food outside. You’ll find picnic tables throughout the museum’s campus. With so much to do and see, it’s no surprise that admission tickets to the museum are good for two days! An added bonus? Kids and teens get in free. Extra fees apply to Make Your Own Glass projects. Corning, NY is known as the “Crystal City” due to its association with the glass industry. Complete your day by taking a free shuttle from the Corning Museum of Glass to the city’s downtown Gaffer District (about 10 minutes away). Walk down historic Market Street and browse through cute little antique shops and glass studios, or follow the Gaffer District’s organized chocolate trail (really!). Take the shuttle back to the museum parking lot and head back to Ithaca. Get some down-home Southern cuisine at this New Orleans-style fish house! The good times are guaranteed to roll at Maxie’s Supper Club and Oyster Bar as the restaurant offers free live music every Sunday and Tuesday after 6 pm. Advance reservations aren’t taken, but take advantage of the restaurant’s 30-minute call-ahead seating to minimize wait times. Kids’ menu available. End your trip with a morning of family fun at the Cascades Indoor Water Park at Hope Lake Lodge in Cortland, NY, just half an hour from Downtown Ithaca. The area’s premier indoor water park, Cascades offers plenty of fun for everyone from the littlest to the most adventurous swimmers. By train: Amtrak to Ithaca train station in Syracuse. Ithaca Airline Limousine can provide transport to and from train station and airport. By bus: Greyhound or ShortLine to Ithaca Bus Terminal.